Taken 1961 Jul 13. Remains of the second warehouse and basin at Cromford. Taken 1952 May 24. Canal agent's office at Cromford, with warehouse behind. 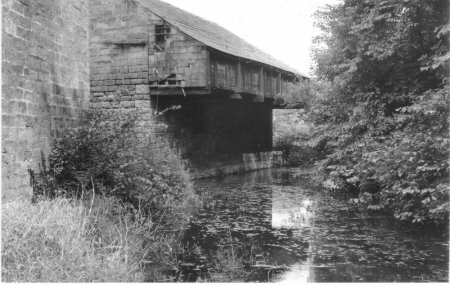 The Cromford Canal was opened in 1794, to bring raw materials to the world's first water-powered cotton spinning mill built by Sir Richard Arkwright and opened in 1771 at Cromford. It also carried coal, iron and lead ore and took prepared cotton away. 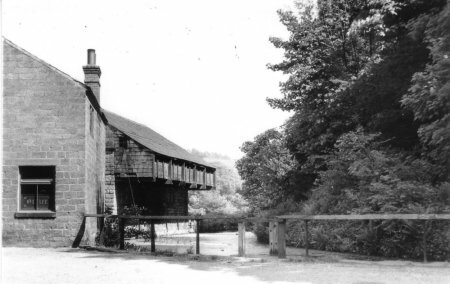 A 33 mile canal was planned from Cromford to Whaley Bridge, but in 1831 a railway (The Cromford and High Peak) was opened in its place, using cable haulage up 9 steep inclines. Goods were transferred to and from canal boats at Cromford Wharf. Originally only one wharf was built, but volume of trade caused a second canal arm with wharf and warehouse to be constructed. This second arm was parallel with and south of the first. The warehouse projected over the moored canal boat to protect unloading goods from the weather. Recently the warehouse (and much else) has been restored by The Friends of Cromford Canal.